(Springfield, IL) – The Illinois Senate tonight passed legislation that restores $28 million to Illinois substance abuse treatment services. Earlier this evening, the Illinois House passed the measure. The legislation, Senate Bill 2412, which reallocated money within the current Illinois budget, now moves to Governor Pat Quinn‘s desk. “Governor Quinn is expected to sign the measure into law,” said Illinois Alcoholism and Drug Dependence Association CEO Sara Moscato Howe. (Rockford, IL) – In remarks made in Rockford last week, Illinois House Speaker Michael Madigan (D-Chicago) laid out his state budget priorities for next year, which include protecting key groups of vulnerable Illinois citizens. Madigan’s comments drew praise from the state’s leading substance abuse prevention and treatment advocacy group. “After suffering more than a 50% reduction of state funding in the last few years, we welcome Speaker Madigan’s willingness to back substance abuse treatment services, which save the state money, and to draw a line in the sand against further budget cuts,” said Sara Moscato Howe, CEO, Illinois Alcoholism and Drug Dependence Association. IADDA CEO Sara Moscato Howe, State Senator William Delgado (D-Chicago), IADDA Board Chairman Peter Palanca. 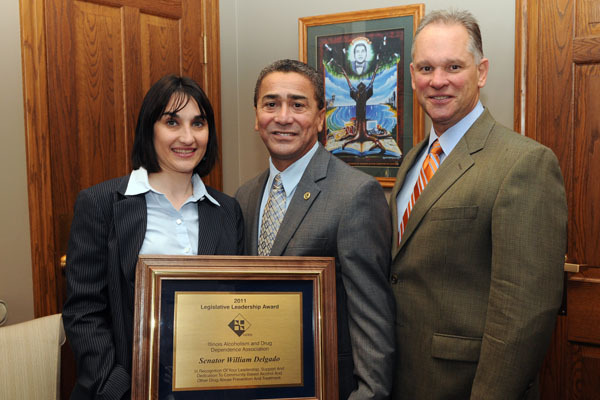 (Springfield, IL) – The Illinois Alcoholism and Drug Dependence Association yesterday recognized State Senator William Delgado (D–Chicago) for his long-time and vigorous advocacy in behalf of addiction health care, presenting him the group’s the 2011 Legislative Leadership Award. “Senator Delgado has served as a champion for those seeking to recover from substance abuse addiction by ensuring that addiction healthcare services are available to them, including the working poor and women with children,” said Sara Moscato Howe, CEO of IADDA. “I have work hard alongside the IADDA to educate the general public about the disease of addiction, sharing the message that addiction can be prevented, it can be treated and people can recover from it,” stated Delgado, Chairman of the Illinois Senate Public Health Committee. Established in 1967, the IADDA is the only statewide advocacy organization in Illinois focusing solely on substance use disorder issues. The organization represents more than 50 prevention, treatment and recovery organizations across the state.